Chitra Santhe, Bangalore’s annual one day art fair was a bit like going to a shopping mall : With 1300 artists and their works packed on one street, hawkers hawking their wares, it was overcrowded and a pain to navigate. But the fair had its perks; for artists, this was an opportunity to show and, hopefully, sell work to more people in one weekend than some galleries manage in six months. This year, the fair sold art worth 2.1 crores. In just one day. Phew! 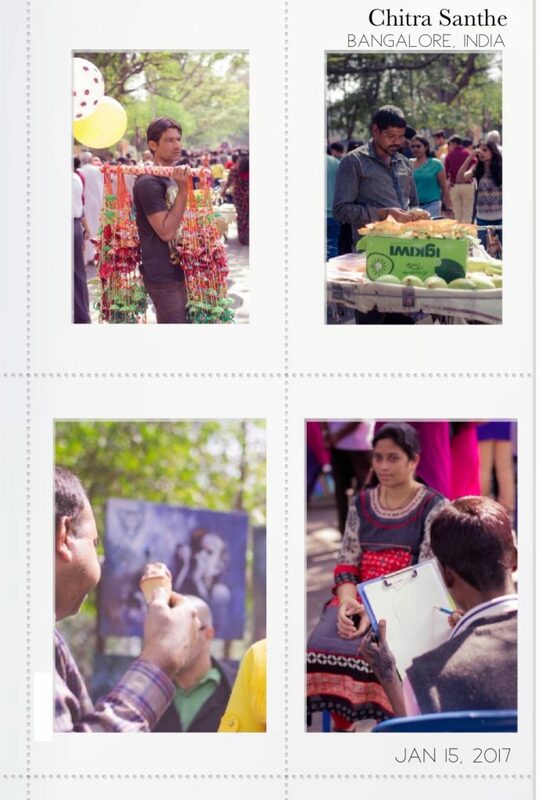 For the 3.5 lakh spectators, the fair was a one-stop shop for binge-viewing art from around the country. And for artists — well, how do artists feel about Chitra Santhe? Are they places to size up competition while being reminded of the soul-eating machine that is the commercial art market? Or are they festive spots for catching up with old friends over Rs.10 packets of freshly roasted peanuts? Do artists lose sleep while preparing for fairs, or do they not really care? 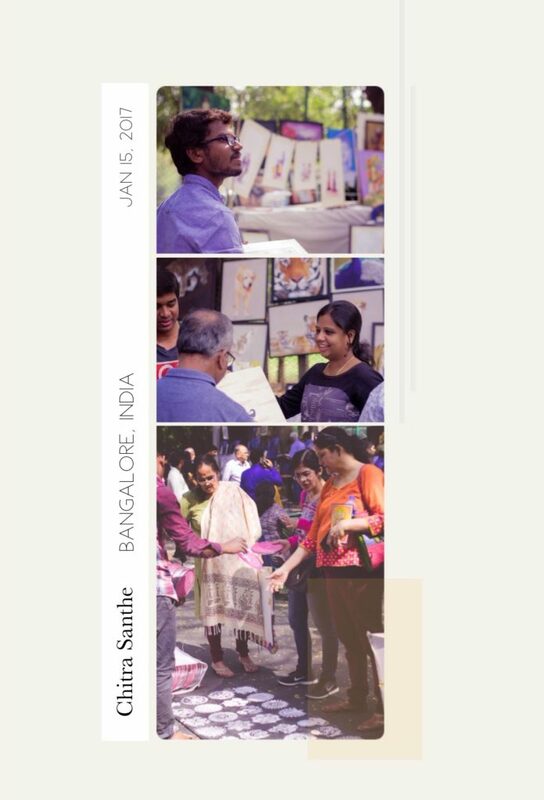 Two of my artist friends participated in Chitra Santhe this year. Both of them literally set up their booth overnight – no preparation, not hoping to make sales but just having fun and excited to show their work to thousands of people the next day. 1. I love the fact that artists from places all over India — most of which I may never visit — are on that one street, presenting works that may (or may not) represent their culture. The accessibility of such diversity in one place is remarkable. 2. They’re kinda weird. They’re like weird reunions where you get to run into a bunch of people who you’d rather not see. I managed to bump into my gynaec (who’s seen my hoo hoo) and that wasn’t pleasant at all. 3. I love to see the variety of work shown — Chitra Santhe is a great testing ground for an artist to test a new type of work. I like to walk around with my husband (and a cut guava sprinkled with chilly powder) and discuss everything we see. It’s like walking through the pages of a book, reading, digesting and journeying through many art stories in real time. And there are the usual narratives, but there are also usually unexpected plot twists. 4. I don’t like the feeling of this very market-driven environment. This feeling of commerce, commerce, commerce. Art should be free. We should all just give everything away. Everything should be free. Well! 5. 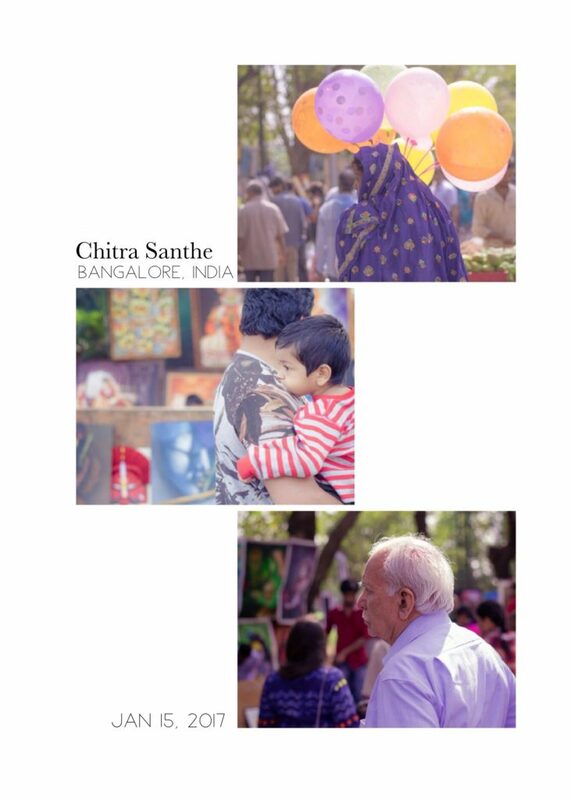 Chitra Santhe is a way to expose your work to a wide audience. As an artist, I enjoy thinking about how my work might interact with a diverse group of people. Showing work at the Santhe is very different in intention from putting together work for a show. You can make one-offs, experiments, play with context in a way that is unique. 6. Honestly, I was more interested in the colorful balloon wallahs, heaps of guavas, mangoes, roasted corn on the cob, ice cream and Bhel Puris being hawked than the art itself. 7. The venue, Kumara Krupa Road – Chitra Santhe needs to move to a larger venue – a big open space with spaced out booths and a separate area for the hawkers selling food. It’s a fair after all. It was quite a stampede and I had to peep and crane my neck to see the paintings that 50 other people were also trying to look at, at the same time. 8. 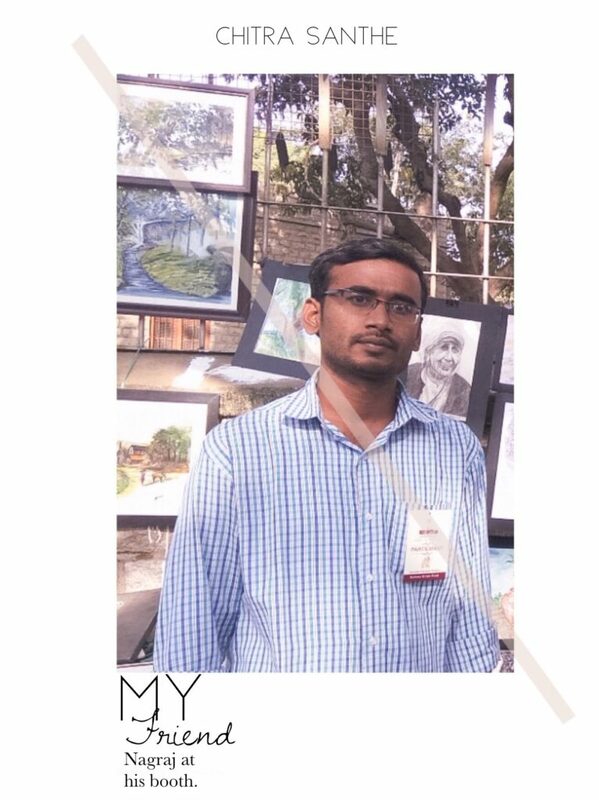 I love the fact that any visual artist from anywhere in the world is welcome to exhibit, it is not curated by the gatekeepers of the art world and you can exhibit for free (except for the Rs.300 application charge) Art is often limited to academic circles – Chitra Santhe is helping make art more democratic and accessible. So hurrah for that! 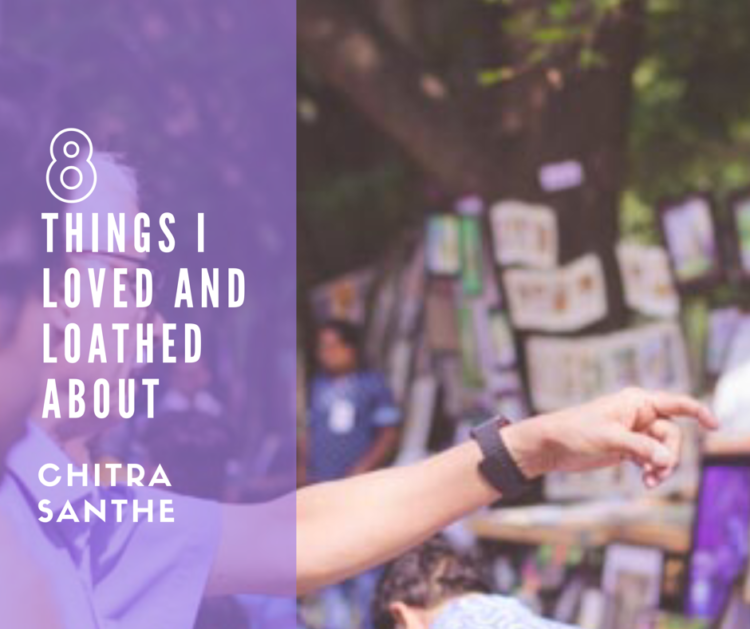 Have you been to Chitra Santhe? I want to know about your experience? Good and bad – tell me!